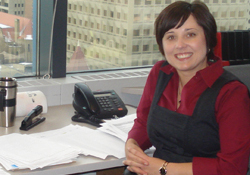 Within the first week of being hired by the City of Calgary, Tina Ritsco was struck by her new employer’s value of sustainable transportation – including running an internal commuter challenge. “I am involved in our Commuter Challenge program because it’s better for the environment, and my carpool-to-train ride is completely stress-free,” said Ritsco. It is no surprise that the City of Calgary has more commuters registered with Carpool.ca than any other municipality in Canada. Ron Schafer, the City’s Transportation Demand Management Specialist implemented the City’s own on-line, year-round version of Sustainable Alberta Associations’ Commuter Challenge back in 2002, and it’s been growing in popularity ever since. Employees input their methods of transportation to and from work and concurrently the system provides them with quantifiable data that illustrates how their commuter efforts in turn affect their environment. “It’s good to track how many kilograms of carbon you’re saving by not driving your car, and in turn it brings out this competitiveness with yourself when you input information and see how you jump spots up from what you were before,” explained Ritsco. The heat is on when the City participates in the SAA Commuter Challenge each year. The week is also packed with prizes such as free bikes and perks such as the chance to drive the C-train!